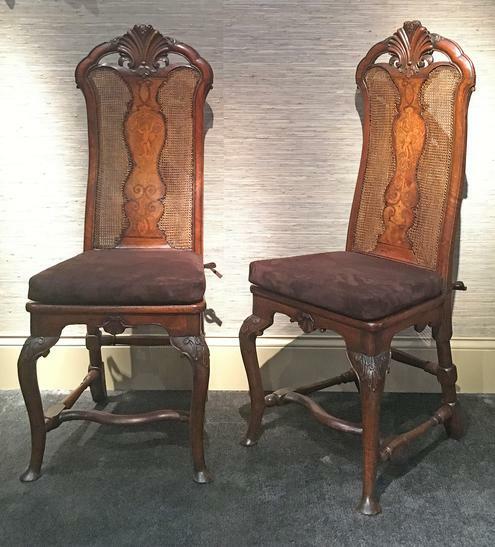 A Pair of Queen Anne Walnut Side Chairs - Hyde Park Antiques, Ltd. The shell-carved pierced toprails above rectangular caned backs wih central vase -shpaed splats each inlaid with classical robed figure holding a parrot aloft, above caned seats with shell-carved apron and cabriole front legs with leaf and scroll carving at the knee, joined by shaped and turned stretchers, on pad feet. A. Bowett, "Early Georgian Furniture 1715-1740," 2009, p. 158, pl. 4:29.